WASHINGTON — NASA could be forced to impose a roughly $1 billion cap — including launch costs — on any new planetary flagship mission it undertakes this decade, far less than the U.S. National Research Council (NRC) recommended for this class of probe in its most recent survey of planetary priorities and more in line with what the agency spends on medium-sized missions. Jim Green, head of the Planetary Science Division at NASA headquarters here, said fiscal hard times necessitate a change in the way the agency develops and builds large-scale missions like the Mars Astrobiology Explorer-Cacher (MAX-C) that topped the NRC’s list of flagship-class planetary science priorities. “We really have to have a fundamental change in how we look at partnering and doing flagships,” Green said in a March 16 interview. “Maybe the real number is $1.2 [billion] or $1.3 billion, but it’s not $2.5 [billion],” he said, adding that once NASA accounts for other high-priority science objectives outlined in the survey, including small- and medium-sized robotic missions, $1 billion is all that remains. “We can’t do a flagship with that on our own,” he said. The 18-nation ESA has already invested millions in the design and early development phases for its ExoMars mission, which calls for launching robotic explorers to Mars in 2016 and 2018. The 2018 mission includes a rover that would operate in concert with MAX-C, leading to a Mars sample-return mission in the 2020s. Green is expected to meet with Fabio Favata, head of ESA’s science planning office, in late March to begin hashing out a new plan for the 2018 Mars mission. He said ESA recently received industry bids for its ExoMars program that were higher than the space agency had anticipated, a factor that could motivate Europe to return to the drawing board as well. Green said the two sides would start with a clean sheet of paper, winnowing down science requirements and potentially scaling back the dual-rover campaign planned for 2018. “One of the reasons why we had two is their requirements and our requirements — we couldn’t stick it all on one,” Green said in the interview. Green said that while it is too early to determine which side might launch a jointly developed Mars rover in 2018, if the payload requires a nuclear power source, that role would fall to NASA. “They don’t have the capability to launch anything nuclear,” Green said of ESA. Such payloads would have to be launched by a United Launch Alliance-built Atlas 5 rocket, he said, noting that under some scenarios, that could consume as much as half of NASA’s roughly $1 billion contribution to the mission. If NASA is unable to pursue a Mars sample return mission with ESA, the NRC recommended the agency develop a campaign to orbit Jupiter’s icy moon Europa, the top flagship-class priority in its previous planetary decadal survey released in 2003. At an estimated cost of $4.7 billion, however, the Europa orbiter is unaffordable, as are the other flagship-class outer planet missions proposed by the NRC panel. ESA, meanwhile, may have to go back to the drawing board on its next L-Class science mission. 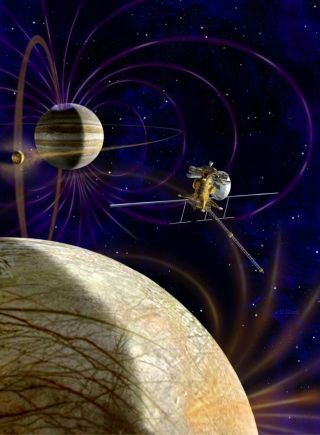 The agency has three concepts under study: the Europa Jupiter System Mission/Laplace two-satellite campaign to Jupiter’s moons, a planned collaboration with NASA; the International X-ray Observatory, which includes contributions from the Japan Aerospace Exploration Agency; and the three-satellite Laser-Interferometer Space Antenna gravity wave detector. ESA was expected to advance one or two mission concepts to the definition phase in June, based in part on NASA’s anticipated contribution as directed in the planetary decadal report. In addition, ESA was to consider flagship-class missions prioritized in the NRC’s most recent astronomy decadal survey released last August. The problem, in addition to NASA’s funding woes, is that none of the science objectives in the three European mission concepts topped the NRC’s planetary or astronomy science priorities for the coming decade. Favata said ESA would not present its decision on the way ahead until February 2012. Favata said ESA could get more than the $650 million euros the agency budgeted for its contribution to any joint L-Class mission. “We foresee a somewhat enhanced financial envelope for the revised mission,” he said, adding that a key activity over the next month will be an assessment of potential modifications to the Jovian-moon mission concept that might preserve most of its science objectives using a single spacecraft. Green said if ESA goes ahead with a mission to orbit Jupiter’s moon Ganymede, for example, NASA would participate.